The Aquastorm 50 batch cleaner utilizes technologies that are common to the Aquastorm 100 and 200 in-line cleaners but are offered in a batch footprint. The software has an advanced user interface that utilizes a 21" touch screen PC with Windows 7 operating system. The software GUI is common across all Electrovert cleaning, wave, and reflow product lines. Today’s challenges for PCB manufacturers hinge on high density, increasing complexity, and miniaturization. Manufacturers who currently clean with batch-type cleaners are looking for a solution that will increase cleaning capability without moving to an in-line cleaner. The Aquastorm 50 batch cleaner utilizes technologies that are common to the Aquastorm 100 and 200 in-line cleaners but are offered in a batch footprint. Torrid Zone drying has set the industry benchmark for drying with in-line cleaners, and is a standard feature on the Aquastorm 50. Electrovert’s patented convection drying technologies for cleaning applications deliver a controlled dynamic process that effectively removes moisture from the PCB. Typical performance includes drying complex assemblies to within .1g of prewash weight. The Electrovert brand name holds the reputation of having the ‘longest product life cycle’ within the electronic production equipment industry, including the Aquastorm 50. While typical batch cleaners are modified version of residential dishwashers, the Aquastorm 50 utilizes field-proven technologies that are common across the Aquastorm in-line cleaners, including fluid delivery and pump designs and drying technologies. Pre-heated wash tank reservoir: The Aquastorm 50 utilizes a wash tank reservoir with immersion heater which ensures the wash fluid is constantly kept at proper temperatures. Chemical isolation: The Aquastorm 50 comes standard with a chemical isolation cycle. The recipe can easily be programmed to include the chemical isolation in the wash process. Torrid Zone Drying: The Torrid Zone drying system is designed to maximize the balance between thermal and mechanical energy within the drying process. The integrated design has proven to use up to 40% less power over conventional drying systems. On board closed-loop rinse: On-board DI water generation for rinse and final rinse cycles. Intelligent Rinse Control: Controls the number of rinse cycles to a user defined rinse water conductivity level. This feature saves on rinse water cycles and cycle time. Zero discharge to drain: An integrated on-board filtration system eliminates all chemical isolation and rinse water to drain effluent. 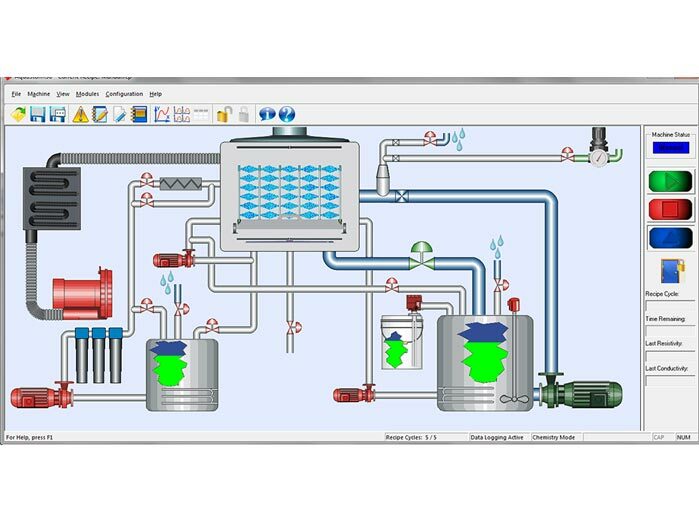 The Aquastorm 50 Batch cleaner can be configured in the software to run in either straight DI water mode or in a chemistry mode (standard in software).